Beautiful apartment with swimming pool away from mass tourism in a quiet location directly on the sea. The house Valentina consists of two apartments - one on the ground floor and one on the 1st floor of the house and is located in Cesarica in Karlobag, quiet and about 400 m from the coastal road, right on the sea or Beach and is ideal for guests who seek peace and relaxation away from mass tourism. The large terrace offers a wonderful view of the sea and the island of Pag and invites you to relax, eat and feel good. Furthermore, you have a barbecue with a beautiful terrace in the garden. The beach is directly accessible from the garden. At the beach there are chairs available. The owners speak fluent German. Internet connection or Wi-Fi is available and included in the price. In the garden of the house is a beautiful swimming pool with stunning views of the sea available, beach chairs and umbrellas are of course available at the pool. Also a table tennis table and table football. The apartment Top 1 on the ground floor offered here in the ad offers space for up to 6 people and has a kitchenette, living room with pull-out sofa bed for 2 persons and flat screen TV with satellite connection, furthermore a bathroom with shower. One bedroom has a double bed and wardrobe, the second has a double bed and also a wardrobe. 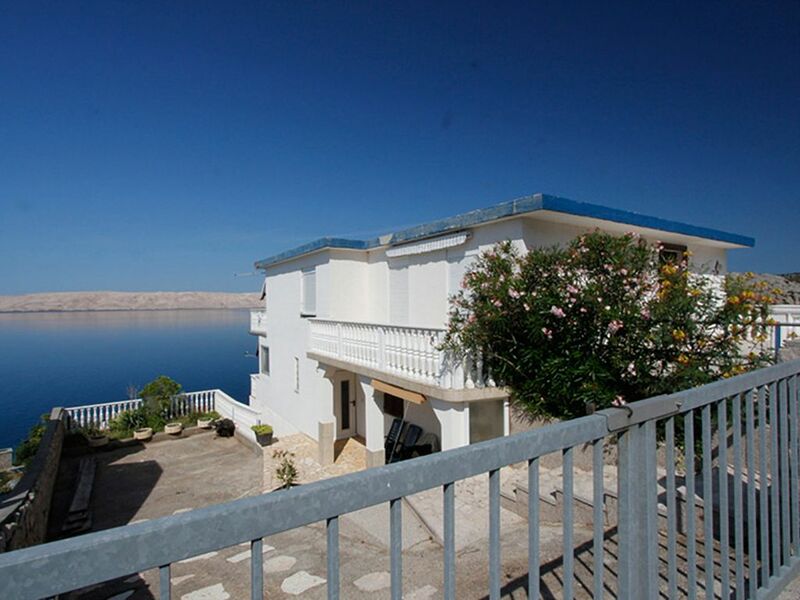 The large balcony offers a wonderful view of the sea and the island of Pag. Air conditioning is available in the apartment. Also on the terrace terrace furniture and loungers are available. The large terrace offers a wonderful view of the sea and the island of Pag. The holiday home Valentina is located directly on the beach. The large terraces offer a wonderful view of the sea and the island of Pag and invite you to relax, eat and feel good. Furthermore, you have a barbecue with a beautiful terrace. The beach is directly accessible from the garden. At the beach there are chairs available. The owners speak fluent German. Internet connection or Wi-Fi is available and included in the price. Pets are not allowed. The center of Karlobag is about 6 km away from the house, where you will find shopping, bars, cafes, bank, post office, etc. The nearest shop and restaurant is about 1 km from the house in Ribarica available. Furthermore, there are hikes and mountain biking in the Velebit and Paklenica National Park, visit to the unique world heritage Plitvice Lakes, day trips to the islands of Rab and Pag, great boat trips to the Kornati Islands etc. Top Unterkunft mit unbezahlbarem Blick. Vermieter absolut und uneingeschränkt weiter zu empfehlen. Eine tolle Anlage, toller Ausblick, super Vermieter! Viele Ausflugsmöglichkeiten um das Land kennen zu lernen, da es unser erster Kroatienurlaub war, wollten wir auch das Land kennen lernen und sind begeistert. Unvergesslich schön die Plitvicer Seen, ein absolutes Muss! The holiday house Valentina consists of two apartments - one on the ground floor and one on the first floor of the house - and is located in Cesarica in Karlobag, quiet and about 400 m from the coastal road, directly on the sea and is ideal for guests who are in the Croatia holidays away from mass tourism looking for peace and relaxation.